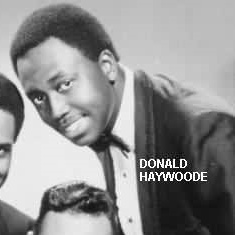 We are sad to let SoulTrackers know about the death of another soul music legend, Donald Haywoode (August 24, 1936 - August 9, 2015). This word comes to us from Ron Henderson, who worked as road manager for Don's group, The Fantastics (a group that in the mid 1970s included future Commodores lead singer J.D. Nicholas), and was also Don's friend. I sadly have to announce the passing of Donald Haywoode (age 78) of The Velours, and latterly of The Fantastics. The Velours had great success in America,especially with the song 'Can I come Over Tonight' which was written by Don. In The UK as the Fantastics the group went on to success with hits such as 'Something Old Something New' After a long illness Don finally succumbed to it on the 9th of August at Hammersmith hospital London. He left The U.S in the mid sixties and came with the rest of the group to The UK where they had a spell of success as The Fantastics and toured extensively. Don and John Cheetdom decided to stay in The UK and have been here ever since. Don is survived by his wife Marian, whom he married in 1975 and had just celebrated their Ruby wedding anniversary this year. Don's funeral will take place on Monday August 17th at mid day at Mortlake crematorium, London. In a year that has seen the death of so many of the great soul music stars of the 60s and 70s, the death of Don Haywood is another sad reminder that many of the greats are passing. But it is also a celebration of a life of bringing music to the world. Thanks to uncamarvy.com and J.D. Nicholas for the photos.